SDR platform Squared_Link is a digital transceiver intended for implementation in wireless modems. Embedded software of Squared_Link is a multimode OFDM transceiver based on OFDM technology, it can work in wideband, narrowband modes, spread spectrum mode and fragmented spectrum mode. 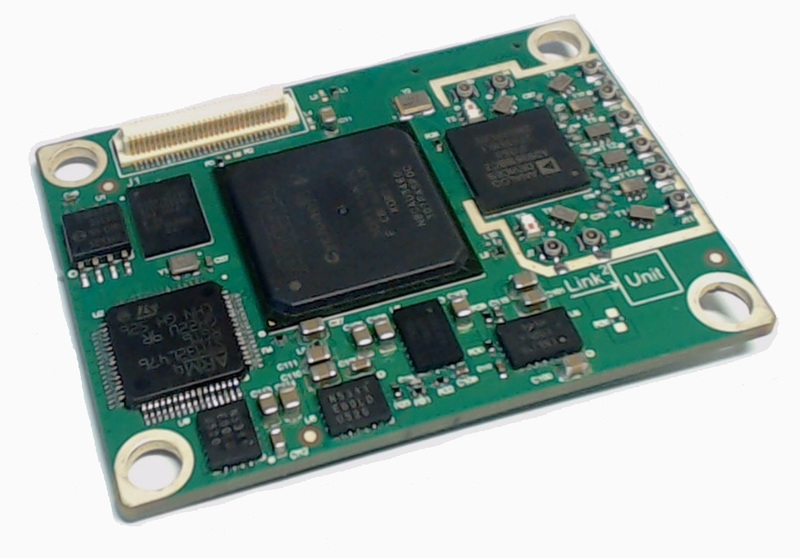 Hardware of Squared_Link is based on Altera's Cyclone V FPGA and AD9361 transceiver. Evaluation kit Squared_Modem includes RF board and motherboard with Ethernet interface, it can be used as standalone solution too. Communication technology: scaled OFDM1024 with unique technology for mixing of wideband, narrowband, spread spectrum and fragmented spectrum signals in one air link frame. (Learn more about OFDM_MultiMode). Duplexing mode: TDD or FDD. Bandwidth: 1-20 MHz (smoothly variable). Modulation: BPSK; QPSK; 8QAM; 16QAM; 64QAM; 256QAM. Maintaining coding rates: 1/2; 2/3; 3/4; 5/6. maximal signal search duration: 1 sec. space time code in MISO and MIMO modes: Alamouti code. Air link frame duration: 2-20 ms.
Cyclic prefix duration: 1/32; 1/16; 1/8; 1/4. Carrier frequency range: 70-6000 MHz. Maximal TX output power: -6 dBm. RX sensitivity depends on bandwidth, modulation, FEC rate and LNA performance (see Squared_Link. Brief description). Information bandwidth depends on bandwidth, modulation and FEC rate (see Squared_Link. Brief description). Network configurations: P2P; PMP; mesh networking. pilot and informational subcarriers location. TX-RX range calculated from signal delay. 5CEBA9 FPGA (SISO, SIMO, MISO, MIMO). Power consumption: 2.9 W (12 MHz bandwidth, TDD mode 50/50, 5CEBA7 FPGA).